It took me an ambarrasing amount of time to figure out that the guys behind the decks aren't Justice (with a drastically different hairstyle, and, I thought the band has only two members?) but a different band altogether. Nevermind that it's written right there in the video title. Not bad. More of the same of what Justice does well. Word on an album? I wasn't paying attention. When my DL gets down to 1 Sec remaining, I get a message from McAfee WebAdvisor: "We found that there might be viruses, spyware or other potentially unwanted programs in the file you are trying to download" BLOCK or ACCEPT? I admit I wasn't taken by it at first listen when Busy P dropped it. Its nice but nothing we've heard before. I looked at the comments on FB out of curiosity and a lot of them were hoping for those 'crunchier' beats and be a little bit more harder again like Cross. I'm kinda diggin the sound of this new upcoming album, even more than Audio, Video, Disco. I like it. Different but still recognizably Justice. I dont't think it's bad, but don't think it's good either. It sounds just like every other Justice track, except for the breakdown. I was hoping for a departure from Audio Video Disco, just like AVD was something different from Cross. This sounds like leftovers from AVD. I think "Randy" would work better without vocals. Drums on Randy keep giving me flashbacks of Robot Rock. Definitely diggin these two tracks. 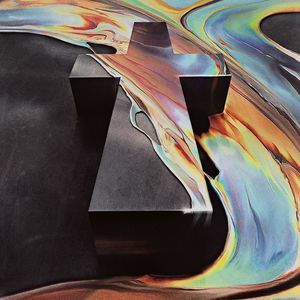 Sure they don't sound like much of a departure from the last two albums, but they're still just as good as most of what Justice has made in the past. Safe and Sound is funky as hell, but I'm really enjoying Randy a lot more. I love a House track that goes all over the place. Actually, I'm not sure if I should be calling this House or Disco. How about... Dhousco? I love a Dhousco track that goes all over the place. Just watched the video for Randy. I agree 100%. Best track from the new album so far ! I really love it. Agreed this is the best track so far.